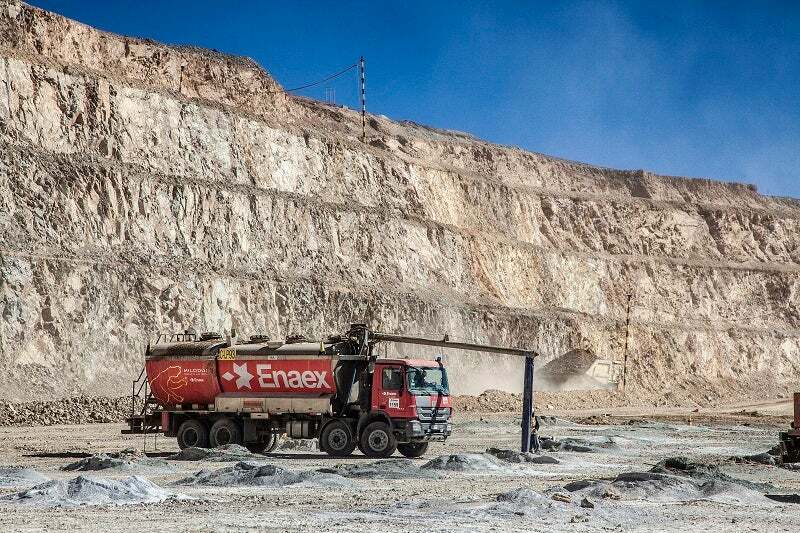 ENAEX is a leading supplier of high-quality blasting services for mining operations. Along with our subsidiary Davey Bickford, our innovative solutions enable us to provide full rock fragmentation services to mining companies both in South America and abroad. We focus our efforts on safety and productivity through innovation, in order to achieve value and sustainability in mining operations, while meeting our clients’ requirements. ENAEX offers a wide range of explosives products and blasting services for operations in the mining sector. We aim to optimise our clients’ blasting process through an integral value proposal, and supply high-technology innovation solutions that address specific problems, enabling us to optimise production process efficiencies in an innovative way. ENAEX’s portfolio includes raw materials, blasting agents, high-performance explosives and accessories. We also provide global technical solutions and assistance, which includes drilling pattern and blast timing designs, as well as vibration and velocity of detonation (VOD) measurements. In addition, our network of on-site service plants offers the necessary resources and implementations to deliver high levels of service, safety, quality and productivity. Enaex offers the whole range of initiation systems, mainly designed and manufactured by its subsidiary, Davey Bickford. A top-notch safety by design, a user-friendly and rugged blasting equipment, as well as an accurate and EMP/ESD protected electronic detonator allows blast design and outcome optimisations in almost all conditions. Davey Bickford also produces non-electric detonators (DaveyNel®/DaveyQuick®), electric (DaveyDet®) and detonating cord (DaveyCord®). Milodón® is a specialised blender and triple truck for the mixing of ammonium nitrate and emulsion. It is also designed for the production of ammonium nitrate/fuel oils (ANFOs), and pumpable and pourable heavy ANFOs for rock blasting applications in open-pit mine sites. The vehicle can be used for manufacturing and transporting blast materials, as well as loading up to 28t of explosives on-site, and features state-of-the-art productivity technology to optimise safe blasting operations. Milodón has a fluidisation system in the ammonium nitrate hoppers, which prevents Prill agglomeration to ensure a consistent mixture dosage and high-quality product. The truck also features an automated programmable logic controller (PLC) loading system, known as E-controller. The system systematises and controls the mixing of raw materials during the manufacturing process and the actual load in each hole. A voucher is issued to provide evidence of the raw materials and the product loaded into individual holes. Its pneumatic hoppers are also equipped with opening and closing valves. As social and market pressures continue to mount, partnerships are driving efficiencies in key areas of the mine. Cast primer or Booster is a high power explosive, made of a highly safe pentolite charge (a blend of TNT and PETN) for the initiation of blasting agents. Prillex® Low-Density Ammonium Nitrate is the main raw material for manufacturing high-quality explosives and blasting agents, especially ANFO (Ammonium Nitrate/ Fuel Oil). Milodón® represents state-of-the-art technology in productivity for the execution of more efficient and safe blasting tasks. How can blasting experts help demystify the path to a leaner and more productive operation. No industry is altogether free from uncertainty, but mining professionals are challenged with a unique set of concerns. Some of these are related to growing pains of the past. Some are linked to radical projections for the future. Our work at Davey Bickford Enaex is ultimately centered on the optimisation of workflows.